MORE SPOILERS: The Hub is an exciting episode because it resolves several story lines, and begins new ones as well. The episode focuses on the battle to destroy the Cylon Resurrection Hub, but also on Laura Roslin, who is among the most complex and interesting characters on the show. As a result, I was able to write an usually expressive and dynamic score. The Hub Theme plays throughout the entire battle sequence, an usual choice since it is inherently not energetic action music. Replacing the expected raging percussion and searing ethnic soloists that typically accompany space battles, this piece is instead introspective and spiritual, because I wanted the music to underscore the incredible importance of the event. 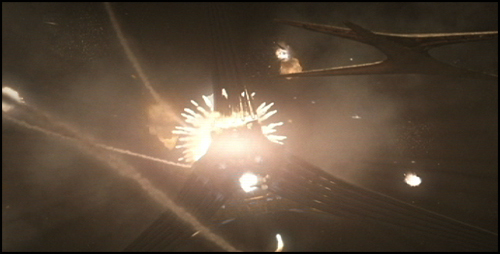 The destruction of the Resurrection Hub completely redefines Cylon existence, and levels the playing field in their war. The score is underlining these essential truths, while allowing the bullets and spaceships to speak for themselves. We needed an orchestra to pull this off, and so The Hub was my first opportunity in Season 4 to work with a large ensemble. It will most certainly not be my last, however. 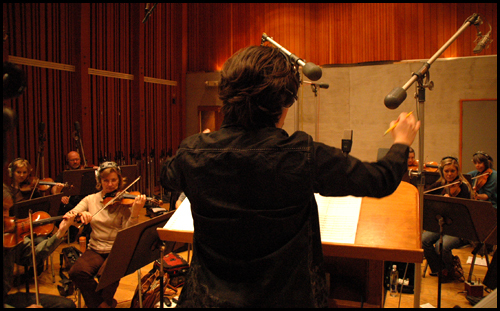 The first time I featured orchestral elements on Galactica was during memorable scenes in Kobol’s Last Gleaming, Parts I & II. The appearance of strings in the context of the otherwise percussion-influenced score made those sequences instantly stand out. However, over the course of Season 2 and 3, the orchestra appeared more frequently and expanded in size as well. The ensembles for The Hub and next week’s Revelations were the biggest used on Galactica yet. 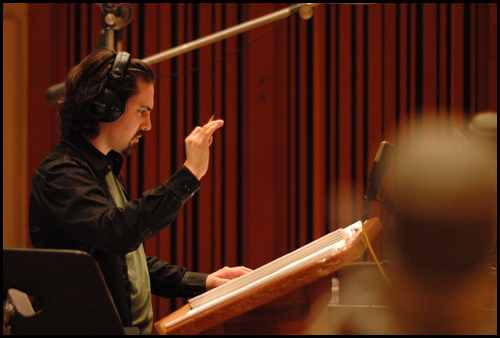 The result produces exciting scores, but it also means that the audience has grown accustomed to the orchestral presence. 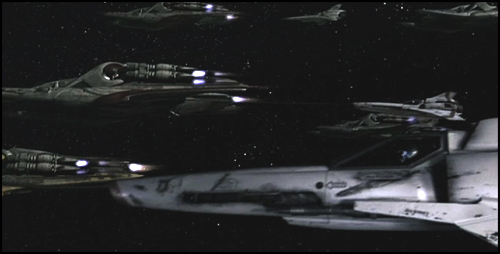 The biwa is first inroduced as the heavy raiders tow the vipers into battle, and it plays throughout the entire attack sequence. The solitary instrument adds a piercing, aggressive energy to the otherwise lush and elegaic string arrangement. I’ve had both wonderful and terrible experiences trying to bring a new soloist into the Galactica ensemble, but working with Doctor Osamu Kitajima playing the biwa was a very rewarding experience. Expect to hear more of this instrument before the series ends. Scoring the destruction of the hub was the subject of much debate as the producers and I discussed this episode. Ultimately, we decided that the music should not comment on the vipers, nukes or the decision to fire. Instead, the score remains mostly silent until the moment of the actual explosion. Here, a solo erhu and the orchestral strings state the last full statement of the Hub Theme that you will hear in the episode. The music is not commenting on the explosion as a strategic military victory (as was our approach in The Hand of God when Lee blows up the Tylium factory). I scored this moment to underline it’s profound impact on the Cylon / Human war. As the first major battle sequence concludes, Gaius is wounded by an explosion. As he looks at his wound and grasps the severity of it, a solo duduk states the Hub Theme melody before the score finally takes a break for a minute. The scene that follows is a shocking revelation as Gaius confesses to Roslin that he was an accomplice to the destruction of humanity. 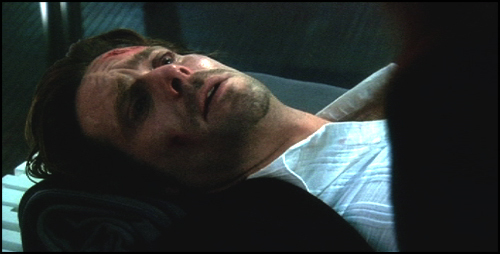 I felt that this was Baltar’s most important scene in the entire season. This represented the close of a story arc that goes back to the first season, even the mini-series. 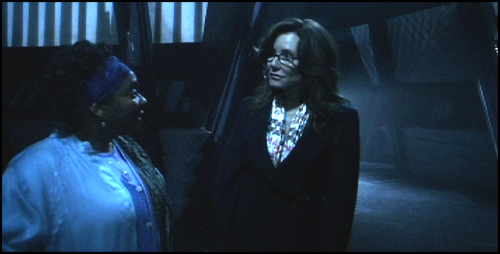 We have always wondered what Roslin would do if she found out the truth about Gaius, and here we get to find out. This progression is most certainly familiar to even casual viewers by now, as it has come to represent Gaius’ new-found religious beliefs. 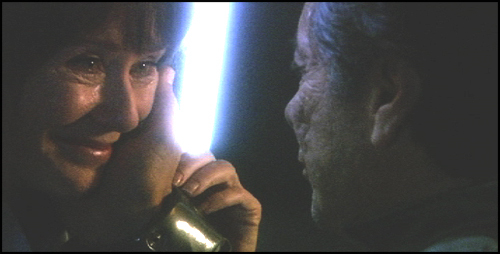 However, when he says his guilt is gone, the score pauses for a heartbeat for an essential turning point in the scene. Laura makes the decision to murder Gaius. As she removes the blood-soaked bandage keeping him alive, an energetic percussion groove adds dread, leading us to the end of the act. 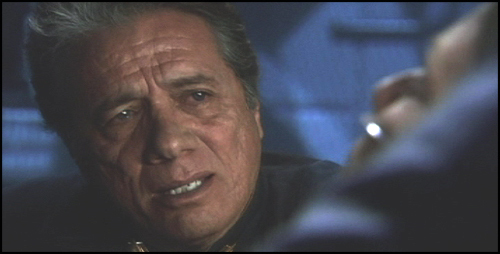 If you dig out the Season One soundtrack CD and cue up Baltar Speaks with Adama (from the episode Six Degrees of Separation), you’ll hear that the percussion comes directly from the end of that track. It a nice way to tie this scene in with the storyline’s roots in the early episodes of the show, but it was also an opportunity for me to test how far my percussion writing has evolved over the years. It was fun for me to go back to this groove and re-arrange it, using everything I’ve learned over the past four years. The synth pads osciallate between G major and G minor, while the gamelan ensemble plays a repetitive open 5th pattern, that also touches upon the 6th, but completely ignores the third. The result is a very emotionally nebulous, dream-like piece that avoids making any sentimental statements. It worked well in Epiphanies, and is even better in this context, adding to the mystery of the visions without commenting on why Laura is experiencing them. Originally written for Resurrection Ship, Part I & II, this theme has made sporadic appearances since, but never as frequently as during the past 3 or 4 episodes. Listen for the iconic solo fiddle first as Laura watches Bill at her bedside, mourning her passing. 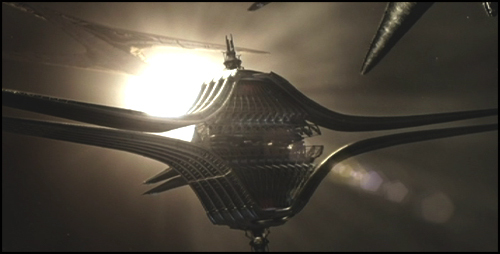 It returns again at the episode’s last scene, stated first as Adama looks up to see the baseship has jumped into his field of vision. Later, as the doors of the raptor open, Laura and Bill finally see each other again. As a fan of the show, I’ve been waiting four years for these two characters to acknowledge their feelings for one another. I knew I had to write something special for them. Fortunately, I’d already written it. The melody I used is still part of their original theme, however it has literally only been heard once before in the entire series. 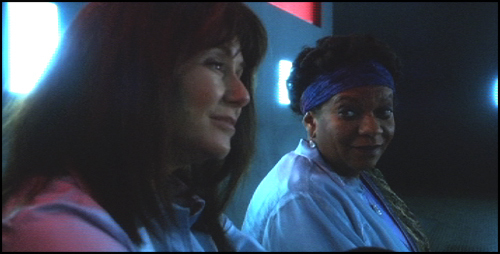 On the Season 2 soundtrack album, cue up Roslin and Adama and listen to the final minute. If the solo fiddle is considered the A Theme, then this uplifting chord progression is the B Theme. It’s actually my favorite part of that entire piece, and I’ve wanted to bring it back ever since I wrote it. But, I knew I had to save it for the right moment, a scene that finally progresses their relationship forward. Without a doubt, this was that scene. Thanks for reading and enjoy next week’s mid-season finale!